Killer Bunnies and the Ultimate Odyssey is a game designed by Jeffrey Neil Bellinger, published by Playroom Entertainment. It is for 2-6 players. It is a collectible non-collectible card game much like the Living Card Games from Fantasy Flight Games such as Netrunner and Call of Cthulhu. In this game, players will be trying to gain civilization points by building cities and adding bunnies to those cities. Along the way they will be using weapons and different scenarios to destroy their opponents civilizations. The player that is best able to manage all the chaos will be declared the winner. To begin, each player chooses one of the 6 colored starter decks of 60 cards or they can create their own deck by combining decks of different colors. There are also expansion decks that can be bought separately and added into the different decks to make new ones. Each player will shuffle their decks to form a draw pile. The players will each draw 7 cards. If a player doesn’t get any resource cards, they may mulligan. The player then shuffles their cards back into the deck and they draw 7 new cards at the cost of 5 civilization points. Each player will take a paper player mat, a d6, d12 and d20. The d20 is set on 10 to represent 10 civilization points that each player starts the game with. The d6 and d12 are also placed on the mat for future use. Each player then begins their first round of play by choosing one card and placing it face down on the top run space. Players then choose a second card to place face down on the bottom run space beneath it. First player is then chosen and the game can now begin. On a player’s turn they will follow 4 steps in order; flip, slide, draw and replace. To flip, they simply flip over the top run card. If it is a resource, it’s placed in the resource spot. If it is a bunny, they can add it to their bunny circle spots as long as they have the correct amount and type of resources to pay for it. If it is a city, it is placed in the city circle spots as long as they have the correct amount and type of resources to pay for it. They must then place at least one bunny from their bunny circle in the city to own it. Players will gain civilization points for adding bunnies or cities as noted by the card. If a player doesn’t have the right amount and type of resources, the card is placed in the discard pile. This is known as burning. Special and Very Special cards can either be played or saved face up, to play later. These cards may also be played directly from the player’s hand instead of flipping over the top run card. Special cards can only be played during a player’s turn but Very Special cards can be played during any player’s turn. Some cards like cities and weapons require a bunny to be in the player’s bunny circle before playing it. Some cards require a city to be in the city circle before playing it. We’ll talk about weapons and some other special cards in a moment. This takes us to the next steps. To slide the bottom run card is moved up to the top run card position. To draw, a player draws a replacement card from their draw pile. To replace, the player adds a card from their hand to the bottom run space. That’s it. Once a player has done these steps, it’s the next player’s turn. Now there will be times when a player will want to attack another player’s cities or bunnies. To do this, the player will use ground weapons or city weapons. Ground weapons attack a bunny. It must be run through the bottom and top run. The player must be able to pay the cost for it and then have a bunny in their bunny circle. The ground weapon card is placed on a bunny that the player wants to attack. That player will then roll their d12 to defend. If the opponent rolls equal to or higher than the number of the weapon, no damage is taken. However if they roll lower, that player’s bunny takes damage equal to the difference between the dice roll and the weapon. This is noted by using the scoring squares. The same is true of the city weapons. There’s only one addition to these cards. To be able to use them, the player must have a city in the city circle as well as a bunny in the bunny circle. If the damage is more than the bunny in the circle or the city, then they are destroyed and the player that attacked it gains civ points. If however the city isn’t destroyed, that player has to check and see if the bunnies that they have in that city are actually able to still be in the city. This is done by seeing if the city has been lowered past the point value of it’s bunny occupants. Of course the player that loses bunnies or cities also loses civ points. There are also two other special types of cards, city modifiers and feed the bunny cards. City modifiers are added to a city after being run through the bottom and top run. They are then placed under a city and the player rolls a d6. That player notes the points with scoring markers and gains that many civ points. The feed the bunny cards also have to be run through the bottom and top run. The card cost is paid and they must have a bunny in their circle. The card is then place on an opponent’s bunny. That player will have to feed the amount of cabbage and water units on the card before the end of their next turn or their bunny will die. On that player’s turn, they can either play a large prune danish card to feed the bunny or they can play a cabbage and water card to gain units based on the number of resource cards they have saved. If they have enough units to feed the bunny then the card is discarded. All of this continues back and forth until one player reaches 60 civ points. The first person to do this is the winner. Each starter deck comes with 60 cards, some scoring squares, and 3 dice; a d6, d12 and d20. There are 6 different colored starter decks and each one is a little bit different and plays a different way. The artwork on these cards is really awesome. They poke fun at a lot of different things like Ace Ventura and Pirates of the Caribbean. There’s a lot of humor and really silly stuff about the cards. The quality is superb in more than just the art though. Each card is really sturdy and stands up well to repeated shuffling and playing. The dice are your normal black polyhedron dice. They roll good and they aren’t cheaply made. The scoring squares are made from thick cardboard and they are really good for keeping track of damage and civ points. These decks have really nice pieces but the star is definitely the cards. They are really great. I will however have to come up with a way of storing the cards properly. I’m not that crazy about having to open a different pack each time I want to play a different color. The rulebook actually consists of 2 double sided rules sheets. One is labeled instructions, read me first. The other is labeled bunny bits: deck A, read me second. The first sheet gives you a basic overview of the game, including set up and how to play. The second sheet gets more detailed and gives you some facts about certain cards. To really understand the game, you need to read both sheets. They’re pretty simple to understand and follow along with. Each one has great artwork and lots of examples on how everything works. I understand that there are several different types of decks so that’s why this is the bunny bits: deck A. I didn’t see anything that was messed up or confusing. It’s pretty cut and dry. There are even deck building ideas on how to make your own decks. All in all, they aren’t bad. The game itself is really fun. It has a bit of that Magic the Gathering type of feel to it with paying the card costs to be able to play the card. That definitely feels like Magic. The ability to attack other player’s cities and bunnies is really neat. Of course the added bonus of gaining their points to your civ is pretty cool too. I love that you kind of have to be thinking 2 steps ahead as some cards won’t see the light of day until 2 turns after they’re played. It’s a really unique way of playing and it adds tons to the chaos of the game. Everything plays really light and fast. A normal game takes about the same as a good game of Magic, about 30 minutes or so. It’s really easy to play and something that the kids really get into. Killer Bunnies and the Ultimate Odyssey is a light humorous card game of satirical bunny goodness. The humor and art on these cards is absolutely great. I love a lot of the pop culture references on them. The game is quick and simple with most games lasting only 30 minutes. It’s easy enough that the kids can enjoy playing. It would be a great introductory game for those kids wanting to get into Magic the Gathering. Fans of Magic will most probably like this game. It’s got a great feel to it that makes it loads of fun to play. I also think that it’s a great alternative to collectible games like Magic and Yugioh. The expansions all have the same cards in them like the LCGs of Fantasy Flight. I really like that aspect of the game as I’m rather bored with CCGs now. I highly recommend it and look forward to trying some of the different expansions. This is a game that is great for kids of all ages. If you’re looking for a fun game that’s easy to learn and play with tons of ways to expand, then you may want to look into this game. 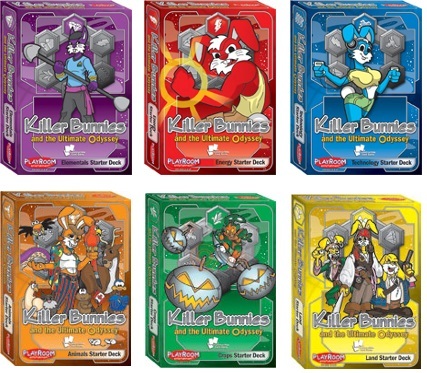 For more information about Killer Bunnies decks and expansions as well as other great games, please check out Playroom Entertainment at their site. This entry was posted in Reviews and tagged bellinger, board, board games, bunnies, card, card games, entertainment, games, jeffrey, jeffrey neil bellinger, killer, killer bunnies, neil, odyssey, playroom, playroom entertainment, ultimate, ultimate odyssey. Bookmark the permalink.